Mark Knopfler started to play Music Man amps around September 1978. These amps were used for all live gigs from then on until the end of the Making Movies On Location tour in 1981. The Music Man amp was used on some studio recordings from this era, probably also on Making Movies, but it was most likely not used on the first album, and neither on Communiqué (here amps borrowed by Robert Palmer, probably Fenders, were used). 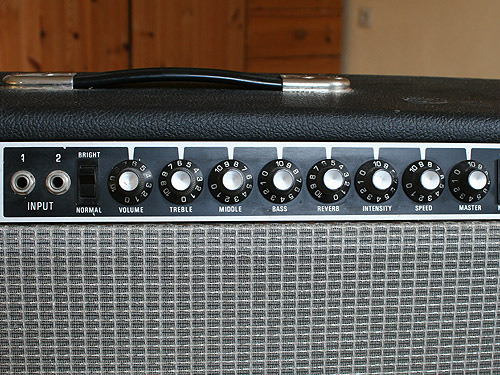 This amp shares many features of a Fender Twin Reverb, e.g. the same control layout, the same effects, a similar size, a similar look. It is surely fair to say that it was Music Man`s version of the Twin Reverb, although the sound is different. HD stands for heavy Duty, 130 for 130 Watts from four 6CA7 tubes (could be switched to low power), and 212 for two 12″-Speakers. 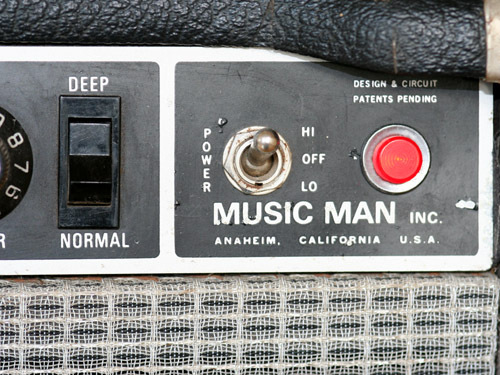 Some general info on Music Man guitar amps can be found in one of the last articles. 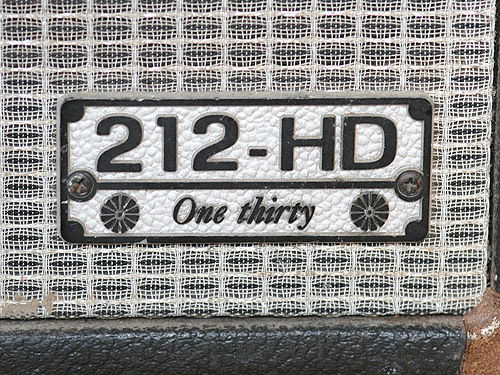 The HD 130 212 has two independent, non switchable channels, just like the vintage blackface or silverface Twin Reverb. Originally the two-channel design allowed to plug in two guitars so that two players could share one amp on a little stage – something that did not really make much sense and was hardly used, except the band could only afford one amp. Both channels have two input jacks (labelled 1 and 2), with 2 being less sensitive so that high gain instruments (e.g. keyboards) could be plugged in without distorting the first gain stage (which is pre the volume pot so that reducing volume does not help in case of being overdriven with a too loud signal). Next to the input we find a Bright switch that works similar to the one on Fender amps: a small capacitor partially overrides the volume poti with the effect that the more treble is boosted the lower the volume poti is set – at almost 10 the switch has zero effect while at 1 it is strongest. Next is the Volume control, and three tone controls (Treble, Mid, Bass). The whole circuit looks identical to a Twin Reverb, but internally the values of the tone capacitors and resistors are different. The treble end is works at a lower frequency range than on the Twin so the sound is a bit fatter with a peak in the high mids. The midrange poti is also more effective than on Fender amps. All Music Man amps also feature a Deep switch that boosts bass frequencies. As this switch works between the pre and poweramp section, it is affective for both channels (the later models of the RD/RP series also have a bright and deep switch but these work and sound completely different). The second channel additionally features a Reverb control and a tremolo with a speed and intensity control. The reverb comes from an Accutronics reverbtank of the same size as in the Twin reverb. Nevertheless the reberb sound is different, less dense and a bit brighter which is intended by the circuit design. The tremolo also sounds different than on a Fender amp. If you set the Intensity control to more than approximately 3, a second harmonic modulation is gradually added. As said, the Music Man sounds different than the Fender amps of its time. The sound is a bit more nasal, with more midrange available. As the pre amp is a solid state design, some typical transistor distortion is gradually added when tyou crank up the amp. For this reason they were better suited for clean guitar sounds, and soon became a standard for country players. However, the transistor distortion does not sound that bad and is helpful to add some grit for clean sounds. The tube power amp section adds a typical warmth that solid state amps normally lack off. Listen to any Dire Straits live recordings from this time and you will get the idea. With 130 watts through two 212 speakers the amp is extremely loud, maybe one of the reasons Knopfler changed from the Twin to the Music Man when the stages became bigger. Tube driver or solid-state driver? 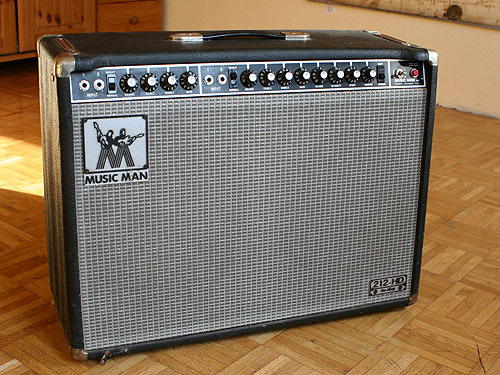 The first Music Man amps (up to ca. 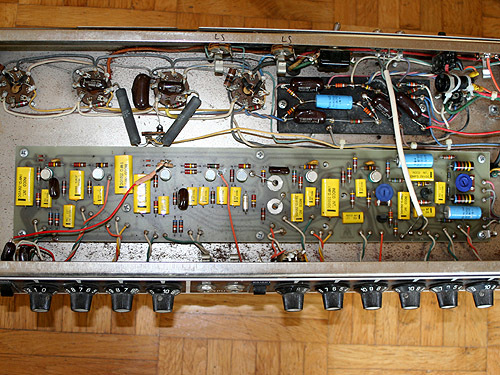 1977) had an additional 12AX7 pre amp tube for the phase inverter section. This tube and the corresponding hand-wired board were replaced with a new soild state circuit board that was said to be more reliable (with the old design a total failure plus the destruction of the expensive output transformer was possible in case of a certain malfunction scenario – however nothing you should really worry about if you own an amp from this time). Generally the tube vesrion is said to sound warmer, although I feel both sound nice and and not too different. It cannot be answered with absolute certainty whether the one that MK used had the 12AX7 tube driver (like all amps before 1977) or not. Generally in the first series (with the tube) the power switch was at the front panel of the amp and the stand-bye switch at the back. 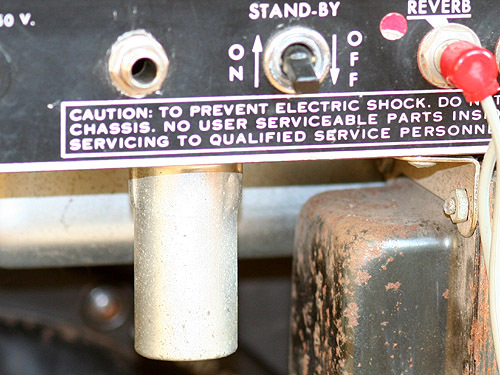 The power switch was labelled with “Hi – Off – Lo” (in the down position it was switched to about only 65 Watts). The later series had the stand-bye switch at the front, labelled with “Hi – Stand-bye – Lo”. On a few concert pictures you can clearly see that MK`s amp had the “High – Off – Lo” labelling (and thus might be the model with driver tube), however, I meanwhile have seen a few transition amps that still had the “Hi – Off – Lo” labelling but already the solid-state driver stage. What makes it more difficult is the fact that around the time of the introduction of the solid-state driver version, Music Man called back earlier amps from the dealers to change them to solid-state as well. Also, it was offered as a free service to convert amps with the tube driver to solid-state. 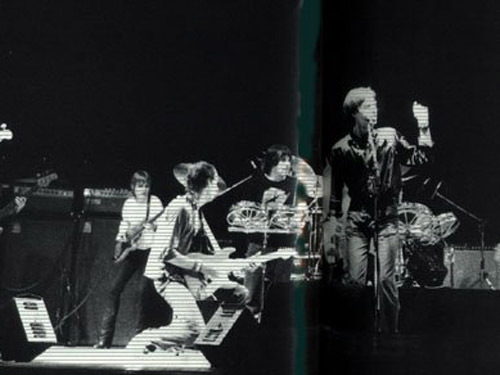 There`s one picture available from the Making Movies tour book that shows the back of MK`s amp. It is almost impossible to see any details, but a slight light reflection (of the aluminium tube cover) might be just at the position of the additional tube. All in all, I admit there is not much more than some speculation on this question. 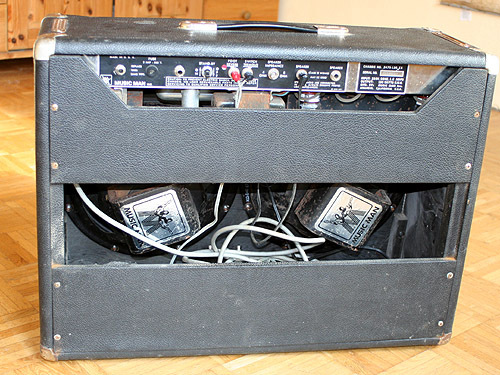 This amp can be seen first with Dire Straits on the Chorus TV 1978 video (a concert from October 14, 1987 in Paris). There are a few shots that show the amp from its back side. Unfortunately it is not possible to tell from these pictures which speaker is inside with certainty. The first amps had Eminence speakers with square alnico magnets, but I have seen models with a different Eminence speaker type that has square magnets of different size and shape (picture below). 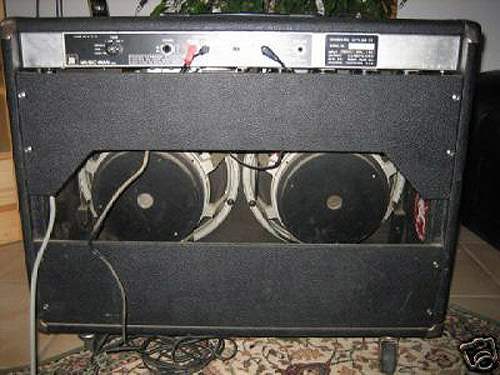 Then – about 1980 – the amp came with Eminence speakers with round ceramic magnets. Furthermore, the amp was optionally available with Electro Voice EVM 12L speakers – the same speakers that Mark Knopfler prefered in later years, e.g. in his Marshall cabinets. 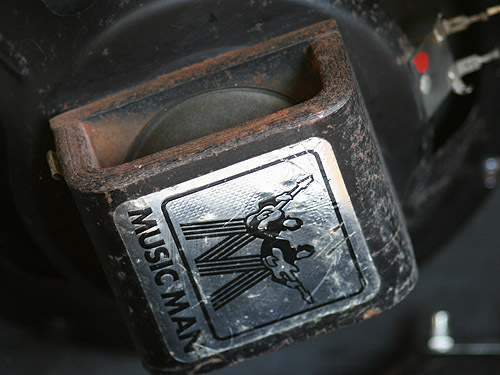 These Electro voice speakers normally had a huge golden magnet, but the OEM version in Music Man amps often had black magnets (picture below). 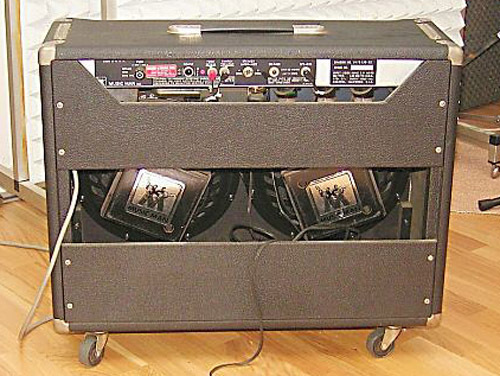 Starting around the time of the US tour in early 1979 (March/April), MK used two of these amps. From summer 1979 one of them was to be equipped with speakers with aluminium dust caps (instead of the normal black paper caps), something that can easily be spotted through the amp grill on pictures of this time. The most famous speakers with aluminium caps was the JBL D120F that was optionally available in some n Fender amps (including the Twin Reverb). In fact, a Twin Reverb with JBLs has for a long time been something like the industry standard for ultra-clean sounds. 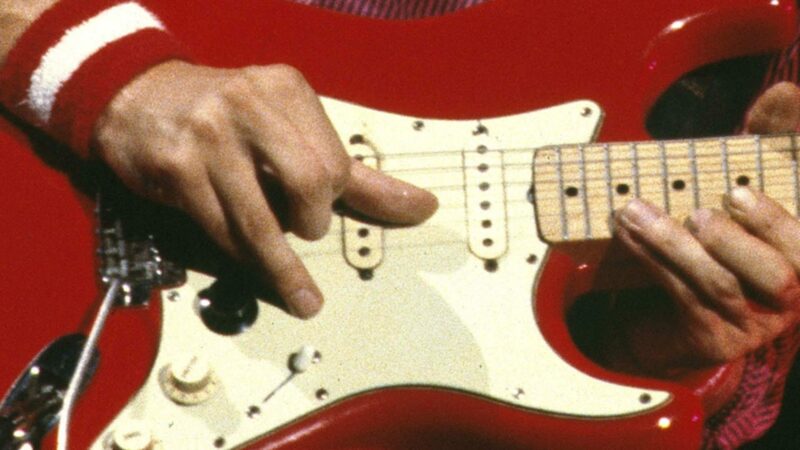 There are chances that Knopfler used JBLs as well, although I meanwhile tend to believe that the dust caps in his amps were a bit smaller than on JBLs. Many other speaker maufacturers had them as well, e.g. on the speakers in the Roland Jazz Chorus, or the Black Widow speakers that were installed in David Knopfler`s Peavey Deuce amp on the same tour. Speakers with aluminium dust caps have a harsher sound with more treble than a conventional speaker. This can easily be heard on all live recordings from the second half of 1979. The most prominent endorser for Music Man amps in the 70ies was surely Eric Clapton, who played two HD 130 heads with 4 speaker cabinets (with two 12″ JBL speakers in each, probably D120F or K120). Clapton`s amps were modified by the Music Man company. This modification included a different circuit for the bright switch, more gain, and a pre-amp out and power-amp in. Music Man service dealers or distributors were sent an installtion instruction for this mod, so it is theoretically possible that Knopfler had it as well. It is unclear why Knopfler started to have two of these amps on stage. One possibility was to have a spare amp in case the first one breaks down, or he played both simultaneously to have more power, or – with a total of four speakers – to hear the amps better from different spots on stage. I prefer to think that both were active (e.g. because both seem to be in use on rehearsals like in the BBC Arena documentary from 1980). 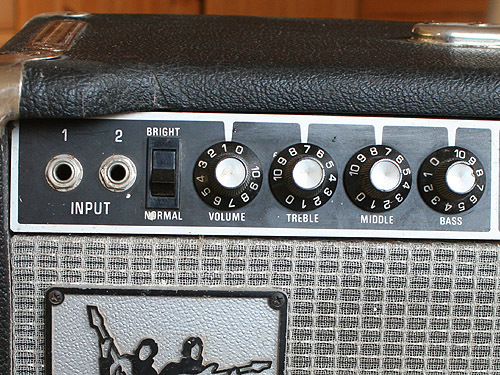 However, it seems that none of the input jacks at the front panel of the second amp was connected (an argument for the spare amp version), or this indicates that the amps had those pre-amp outs and power-amp ins to connect them from the back side (like Clapton did), an argument for the Clapton mod on Knopfler`s amps. While the more-gain option of this mod does not change the clean sound, the bright switch works completely different with the Clapton mod, more like on later Music Man amps. It is much sharper, but less brittle. In addition, it is always effective, no matter of the volume knob position, while the standard bright switch is the more efficient, the lower the volume position is. The same Music man amps were used on the Making Movies tour in 1981, driving closed Marshall 4 x 12″ cabinets. They reappeared on the Nelson Mandela birthday concert, Wembley Stadium, 1988.
up is just nice and that i could assume you are knowledgeable in this subject. Well along with your permission let me to grab your feed to keep up to date with approaching post. looking for a music man 4X10 combo amp at a good price. I´d like to listen or see DS first warm up gig done june 8th 1988. Do you know where I might find it? I have a Musicman amp and speaker, what’s it worth? Strawberry Studios was created and used by 10cc. That’s a piece of history right there. Never part with it.